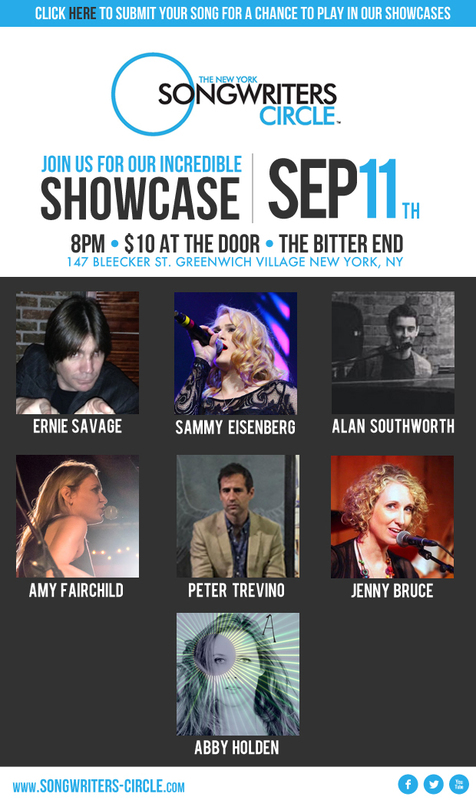 We have an INCREDIBLE songwriter showcase coming up for you Monday september 11th! This will be a unique show featuring 5 US acts and a special apperance by Abby Holden! Abby Holden – Abby was born in NZ, and raised in rural Tamahere. Attending a school with a mere 100 pupils. A passion for music saw her forming the band ‘Skyla’ and performing live on Good Morning, travelling to New York for two solo tours,- performing throughout Europe – settling in London and releasing her 4th album. Sammy Eisenberg – Sammy Eisenberg is a 25 year old singer/songwriter from Westchester, NY. She just recently graduated from Berklee College of Music with a Degree in Songwriting. She writes songs to inspire people. Lyrics are her specialty and she loves to tell stories through them. Performing is what Sammy lives for, she loves to connect with the audience and share her music. Alan Southworth – As the son of musicians, Alan Southworth has been playing music all his life — from classical piano lessons, to bass and mandolin with the family band, to singing a cappella for royal families in Europe and on the stages of Carnegie Hall and Lincoln Center. Alan now lives in NYC, where he continues to write and perform original music on piano, citing influences including Stevie Wonder, Michael Buble, Adele, and John Legend. Stay tuned for his first EP, which will be released this winter. Ernie Savage – Ernie Savage is an American composer, producer and performer (multi-instrumentalist and vocalist). As one half of the composition team “Savage and Laporta” he has composed and produced scores, themes and promos for film and television that have included NBC’s Early Today Show Theme, PBS Kids’ Ready to Learn Campaign, Shark Hunters, and the documentary, “Running in High Heels”. In 2005, Savage and Laporta won the Promax Gold Award for their musical theme to the popular TV series ”The Best and Worst of Tred Barta”, which aired on Comcast’s Outdoor Life cable network.